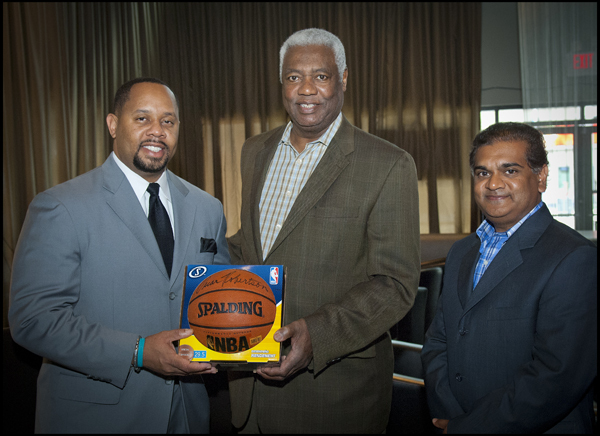 NBA All-Star Legend Oscar Robertson speaks out to create awareness! Oscar not only sits on the board of the Foundation, he is also prostate cancer survivor. Read his full survivor story. In 2012, Oscar participated in a Media Tour that helped us officially launch The International Prostate Cancer Foundation and create awareness world-wide on the importance of getting screened. From Fox Sports and Yahoo Sports to a Public Meet & Greet and Educational Event. Oscar Robertson lent his time and story to spreading Prostate Cancer Awareness nationwide. Other notable interviews: Bloomberg radio, the Bleacher Report, Central Florida News 13, My Fox Orlando, the Orlando Sentinel and many more. Mimic Technologies JOINS THE FIGHT! Mimic Technologies showed its support of Dr. Vipul Patel's International Prostate Cancer Foundation by making a donation to the foundation for each new "Like" the new Mimic Facebook Page received during the 2012 American Urologic Association Annual Meeting and throughout the month of June. Mimic is dedicated to furthering the research and treatment of prostate cancer. The 2013 Vero Beach Men's Health Forum invited men and their spouses to participate in the quest to improve men's health. With well over 70 community members in attendance, the educational event turned out to be a huge success. The program featured NBA All-Star Legend Oscar Robinson as guest speaker, along with Dr. Vipul Patel and respected faculty professionals. The event, in partnership with Florida Hospital’s Global Robotics Institute, was held with efforts to promote research, educate men and encourage prostate cancer screening. Men and their spouses were invited to learn about men’s healthcare maintenance, basic screening practices and advanced nutritional and healthy lifestyle practices. We would like to recognize IPCF founder Dr. Vipul Patel along with Dr. Skip Franco and Mr. Edward Mellet for organizing and participating in the event. 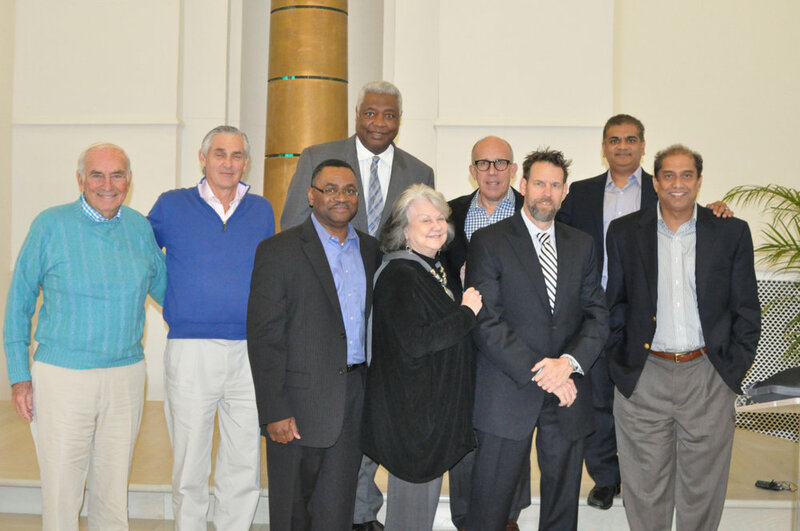 In addition, the forum featured NBA All-Star Legend Oscar Robinson as guest speaker, along with faculty members Mr. Bill Kelly, Dr. Atul Madan, David Robinson MD, Dr. Ranjan Perera and Cynthia Buffington PHD. Special thanks to all who attended. We encourage you to share your experience and spread knowledge as our hope is to extend this program to communities nationwide. For full highlights and photos visit The International Prostate Cancer Foundation on Facebook & view the full album. ✉ Do you have an awareness event? 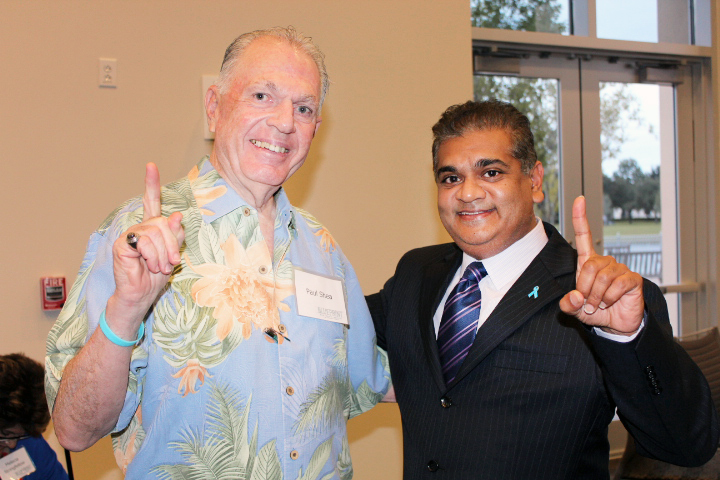 On May 10, 2013 the International Prostate Cancer Foundation awarded Ranjan Perera, Ph.D., scientific director of analytical genomics and bioinformatics at the Sanford-Burnham Lake Nona campus, $60,000 to fund a postdoctoral fellow in Dr. Perera’s lab. “Sanford-Burnham can really make an impact in the field,” said our founder Dr. Vipul Patel,as he acknowledged Dr. Perera’s work to identify molecular markers for prostate cancer. With a shared goal to develop better diagnoses and treatments, this post-doctorate grant is only the first step in a long and mutually beneficial partnership between us here at the International Prostate Cancer Foundation and the great minds at Sanford-Burnham. In Sanford-Burnham Lake Nona labs, Dr. Perera and his team were working on early prognostic markers for prostate cancer. The goal was to be able to diagnose prostate cancer earlier, through a simple blood test instead of an invasive biopsy. “This research is urgently needed as professionals from all aspects of the field have been calling for these molecular markers. Not just for prostate cancer, but other malignant tumors as well,” explained Perera. We encourage you to read more about Dr. Perera’s research here. Partnering with the Florida Hospital Foundation, the International Prostate Cancer Foundation is proud to lend sponsorship to an Educational Program — Blueprint for Men’s Health: A Global Robotics Institute Survivorship Program. Recognizing the importance of ongoing follow-up patient care, Dr. Vipul Patel and team have worked to develop this pilot program to serve as a resource for patients. Blueprint for Men’s Health: GRI Survivorship Program is the first of its kind. It provides a tailored assessment of an individual’s health care needs as well as vital information, assisting patients with various challenges that must be met following prostate cancer surgery. Focused on addressing post-cancer concerns such as nutrition, relationships, exercise, genetics and planning for a life after cancer. The organization hopes to build support and foster a community for those fighting prostate cancer.